There is limited literature on the management of cataracts in juvenile xanthogranuloma (JXG). A 2-month-old girl presented to us with hyphema, secondary glaucoma OU and skin nodules suggestive of JXG. She developed bilateral cataracts during her follow-up and was treated successfully with cataract surgery and aphakic rehabilitation. Cataracts have been reported in juvenile xanthogranuloma (JXG), but there is limited experience with regards to management and long-term outcome. Early treatment is essential to prevent amblyopia. We report successful management of bilateral cataracts in a patient with JXG. A 2-month-old girl was brought to us with haziness of both eyes for the past 20 days. She was a full-term baby delivered by cesarean section with a birth weight of 2.75 kg. Her antenatal period was uneventful. The parents denied any history of trauma and the child was otherwise healthy. 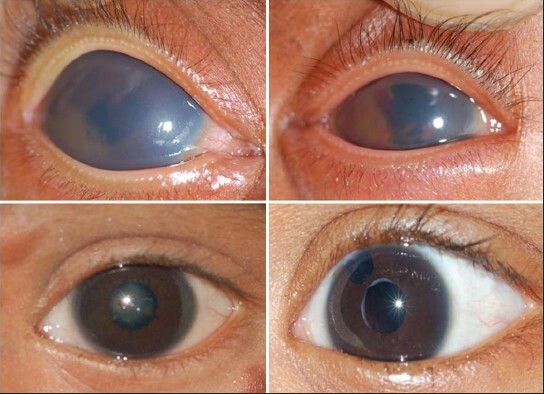 On examination (under general anesthesia), she was noted to have conjunctival hyperemia, increased corneal diameter (13.5 mm OD, 11 mm OS), corneal haze with small blood clots in the anterior chamber of both eyes. No iris nodules were evident [Figure 1]. Intraocular pressure (IOP) was noted to be 20 mm Hg OD and 8 mm Hg OS by Perkin's tonometer. A B-scan ultrasound of the posterior segment was normal OU. 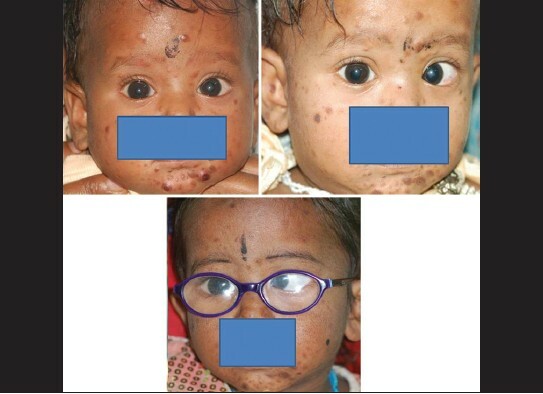 A few yellowish-orange skin nodules were noted on the forehead and neck [Figure 2], that progressively increased on follow-up. Remainder of her systemic and neurological examination was normal. Her hemogram and coagulation profile were within the normal limits. Excision biopsy of a forehead skin lesion was performed under general anesthesia and histopathological examination of the specimen showed non-langerhans histiocytic proliferation [Figure 3]. Immunohistochemistry was negative for CD1a and cytokeratin; positive for CD68. With the above clinical picture and laboratory finding, a diagnosis of JXG was made. She was started on a topical antibiotic steroid combination, cycloplegic and dorzalamide OU. On her review visits, she developed posterior synechiae and a few iris nodules in the left eye, which resolved with intensive topical steroids. Her IOP and fundus examination were within the normal limits. The steroids were tapered off after 2 months. She maintained a steady central fixation throughout her treatment and was also on regular review with a pediatrician. Four months after her first presentation, she developed bilateral anterior subcapsular cataract, which gradually progressed. She underwent cataract surgery in the left eye under general anesthesia. Topical prednisolone acetate 4 times a day was added to topical antibiotics a day before surgery. A superior bridle suture was placed. After peritomy, the bleeders were cauterized and a limbal groove made with a blade breaker. The anterior chamber was entered by deepening the groove and trypan blue was injected under an air bubble. Intracameral adrenaline was used to achieve pupillary dilatation and reduce intraoperative bleeding. Subsequently, 2% hydroxypropyl methylcellulose was injected into the anterior chamber. Iridocapsular adhesions were gently lysed by sweeping a cyclodialysis spatula under the iris. The anterior capsule was punctured by a bent 26 G needle and capsulorhexis done with a Utrata forceps. The lens matter was aspirated by a Simcoe cannula. The bottle height was raised to increase pressure in the anterior chamber and tamponade any bleeding. Subsequently, the posterior capsule was punctured by a bent 26 G needle in a sideways fashion and capsulorhexis completed by an Utrata forceps. Sufficient anterior vitrectomy and a peripheral iridotomy were done by an automated vitrector. An intraocular lens (IOL) was not implanted given the age of the patient (<1 year). Tight wound closure with 10-0 monofilament nylon suture was ensured. After surgery, she was started on topical steroid antibiotic combination and cycloplegics, which were tapered over 6 weeks. The right eye cataract surgery was done 6 weeks after the left eye surgery and a similar procedure was followed. Her perioperative period was uneventful. On her last follow-up, 1 year after surgery, the child was comfortable with aphakic correction and the visual axis was clear. The IOP was monitored with Pulsair tonometer. The IOP was noted to be normal on all occasions and no antiglaucoma medications were needed. The skin lesions appeared to be regressing. 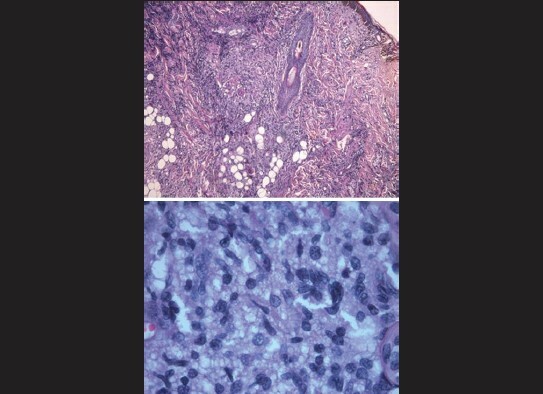 Touton's giant cells were absent in our patient; however, she had features suggestive of a non-langerhan's cell histiocytosis as suggested by the absence of a CD1a and cytokeratin. Positivity for CD68 suggested a histiocytic proliferation. This in conjunction with typical clinical features led to the diagnosis of JXG. We could not find any other reports detailing on cataract surgery in JXG. Management as detailed above may reduce the risk of bleeding and improve the visual outcome. Pollono D, Galan M, Curuchet A, Drut R, Pollono A, Rodriguez J. Juvenile xanthogranuloma with bilateral ocular involvement: Complete response after treatment with vinblastine: Case report. Eur J Ophthalmol 2009;19:1069-72. Chaudhry IA, Al-Jishi Z, Shamsi FA, Riley F. Juvenile xanthogranuloma of the corneoscleral limbus: Case report and review of the literature. Surv Ophthalmol 2004;49:608-14. Berrocal AM, Davis JL. Chorioretinal involvement and vitreous hemorrhage in a patient with juvenile xanthogranuloma. J Pediatr Ophthalmol Strabismus 2005;42:241-2. Vijayalakshmi P, Shetty S, Jethani J, Devi TB. Bilateral spontaneous hyphema in juvenile xanthogranuloma. Indian J Ophthalmol 2006;54:45-6. Sukavatcharin S, Cursino S, Li G, Green RL, Lim JI, Rao NA. Xanthogranuloma of the iris simulating melanoma in an adult. Am J Ophthalmol 2007;143:529-31. Vasavada AR, Nihalani BR. Pediatric cataract surgery. Curr Opin Ophthalmol 2006;17:54-61. Plager DA, Lynn MJ, Buckley EG, Wilson ME, Lambert SR, Infant Aphakia Treatment Study Group. Complications, adverse events, and additional intraocular surgery 1 year after cataract surgery in the infant Aphakia Treatment Study. Ophthalmology 2011;118:2330-4. Ahmadieh H, Javadi MA. Intra-ocular lens implantation in children. Curr Opin Ophthalmol 2001;12:30-4. Biglan AW. Why is there an Infant Aphakia Treatment Study (IATS)? J AAPOS 2011;15:413-4.